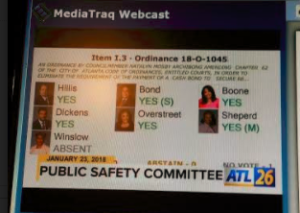 (APN) ATLANTA — The Atlanta City Council is currently considering an ordinance, 18-O-1045, to do away with cash bonds and replace them with a signature bond or “recognizance” for non-violent, indigent defendants who are charged with misdemeanor violations. The ordinance was introduced by Councilwoman Natalyn Mosby Archibong (District 5), on behalf of Mayor Keisha Lance Bottoms’s administration. Cash bond practices disproportionately harm low-income people, homeless people, and Blacks and other minorities, more than other groups. This growing awareness nationwide has created the impetus for changes in public policy at the local level – in city and county governments. Earlier this year, the Southern Center for Human Rights warned that Atlanta’s current cash bond system could be unconstitutional and contributes to the criminalization of poverty. They sent a letter to Mayor Bottoms asking her to lead a change in the city’s cash bail system. In what could be cautiously described as a sign that the Bottoms administration may be off to a relatively progressive early start, Mayor Bottoms did just that. “Too many people have been held in jail on minor charges because they couldn’t afford to pay bail. It is time for the City of Atlanta to address bail reform to decouple criminal justice outcomes from a person’s economic status,” Archibong said in a press release. “This legislation will not cover habitual or violent offenders. It specifically excludes repeat offenders and those that have been charged with a violent crime,” Archibong said. This paradigm shift is coming about after years of work from organizations like Solutions Not Punishment and others that have lobbied against policies that criminalize homelessness and poverty. For example, Southerners on New Ground (SONG) recently bailed out Black women on Mother’s Day. This was part of a nationwide coordinated “Black Mama’s Bail Out Day” by racial justice groups. This led to a Father’s Day Bail Out by the Butler Street Christian Methodist Episcopal (EMC) Church and Don’t Count Me Out. Activists bailed out fourteen men who had been jailed for minor violations like jaywalking and panhandling. In 2016, Atlanta Progressive News reported on Marshall Rancifer’s investigation into the criminalization of homeless people in Atlanta, which exposed that of a total of over 100,000 people arrested between 2012 and 2015 for “quality of life” violations, the majority of people arrested were Black. This groundswell moved then-Councilman Kwanza Hall (District 2) to introduce an ordinance to repeal some or all of dozens of provisions in Chapter 106 of the City of Atlanta Code of Ordinances. Many of these quality of life violations target homeless, poor, and Black people, and other marginalized groups. Unfortunately, only a few of the violations were repealed: several that were identified as preempted by state law, unconstitutional, or archaic by the Law Department. In addition, the City reduced the possible municipal penalty for up to one ounce of marijuana from jail time to a fine in Atlanta. At the January 23, 2018, Public Safety/Legal Administration Committee meeting, advocates with groups like American Civil Liberties Union (ACLU) and SCHR spoke in general support of the No Cash Bail ordinance, although some said the ordinance needed more work. “In the United States we have a major crisis with over-incarceration. We represent five percent of the world’s population and yet we incarcerate 25 percent of the people who are held as prisoners,” Burrell Ellis, Political Director of the ACLU of Georgia and former CEO of DeKalb County, told the Committee. “Sixty percent of people sitting in jails are there without being convicted of a crime, but they can’t afford bail, so they just sit in jail. It’s the insurance companies that benefit from bail – they are the profiteers,” Ellis said. According to a recent report released by Color of Change and the ACLU, the bail bond industry deprives people of their federal Constitutional rights. “Bail bonds are a predatory practice that traps Black families and poor people in debt… Taxpayers foot the bill for needlessly locking up poor people before trial; the government is essentially subsidizing a racist, unnecessary, and dangerous industry,” Rashed Robinson, Executive Director of Color of Change, said in the report. “These people are non-violent offenders and there is no reason they should be arrested in the first place. We have a pre-arrest diversion program; and instead of police officers arresting people that have mental health issues, we can send them to treatment,” Christopher Bruce, Policy Counsel at the ACLU, testified. “We remain committed to ending the criminalization of poverty . There should not be a two tier system of pretrial justice. Whether you are released from jail, should not be determined on how much money you have. This legislation is a good first step, but falls short in dealing with ending wealth-based discrimination in Atlanta,” Attorney Marissa Dodson, Public Policy Director, SCHR, told the Cmte. Dodson cites the City of New Orleans, Louisiana, as having model legislation more consistent with the principle of people being released without regard to how much money they have. The Vera Institute for Justice developed and operated New Orleans’s first comprehensive pre-trial services program. It screens people who are detained pre-trial and establishes their risk to public safety or of flight. The appearance rate for New Orleans Pretrial Services (NOPTS) clients is over ninety percent. Chief Judge Calvin Graves with the Atlanta Municipal Court gave the Council‘s Public Safety Committee a copy of their updated standard operating procedures (SOP) for bonds. The new SOP already allows the Court the flexibility and discretion to provide signature bonds on non-violent traffic and non-violent city ordinance offenses. The bail bonding industry and others spoke to oppose the legislation. Scott Hall and Charles Shaw urged caution on eliminating cash bail. Hall said he believes the failure to appear in court will skyrocket if this ordinance is passed. Shaw believes that it is not a systemic problem and people are not languishing in jail because they don’t have financial means. Both men said they had a good conversation with and support who they described as the “gentleman from BLM” or Black Lives Matter. They were clearly referring to Tyree Lavelle Conyers-Page, or “Sir Maejor,” a known cop impersonator and interloper who is not, in fact, affiliated with the national organization. Conyers-Page incorporated a Georgia entity called Black Lives Matter of Greater Atlanta. He was kicked out of BLM Atlanta for being homophobic and misogynistic; for allegedly attacking several Black women; and for not sharing BLM goals, values, or guiding principles. The BLM Global Network name and images are copyrighted. BLM Atlanta attorneys want it formally recorded that they have issued a cease and desist notice to Sir Maejor to stop using the organization’s name and images to raise money or to present his organization as BLM. The PS/LA Cmte will have a Work Session on tomorrow, Thursday, February 01, 2018, from 12:30 p.m. to 3:30 p.m. in Committee Room One; public comment will be allowed for an amount of time to be determined by the chair, of no less than one minute per person. The Full Council will meet on Monday, February 05, 2018, at 1 p.m., and will consider what is expected to be an amended ordinance.